My girls and I opened the parcel with excitement and oohed and aahed when we discovered what was inside. 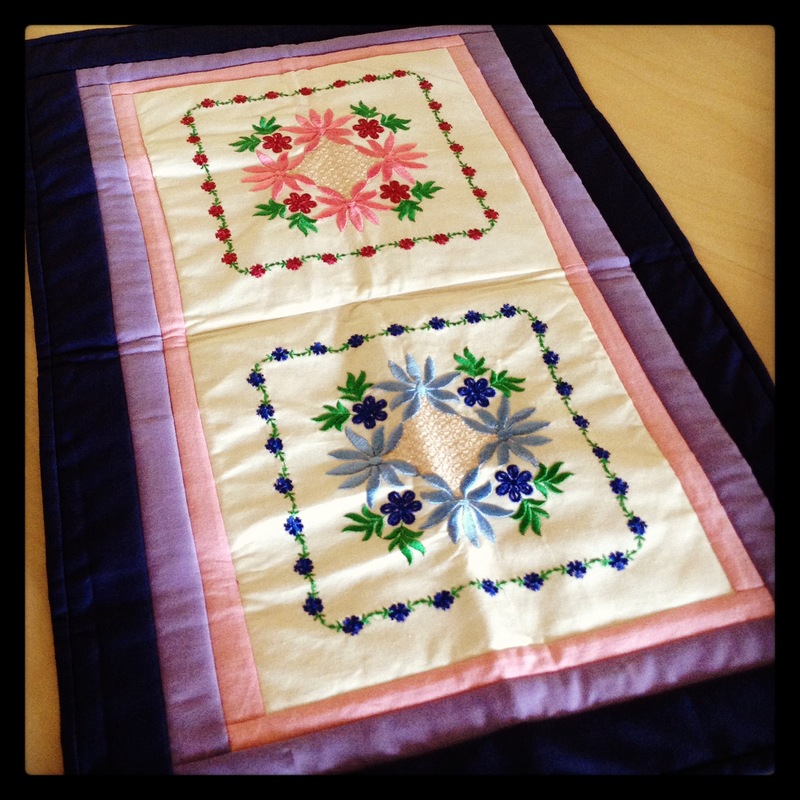 I find the quilts that my mom makes since her retirement beautiful and was pleased to receive a small piece of her work. I have placed the runner on top of the coffee table in the living room. I now see it everyday when I pass the table and can enjoy it when I sit on the sofa. It brings colour and beauty to the corner of the room. What graces your coffee table? I’m more excited about the embroidery. I’ve only done hand embroidery myself but people seem to think that machine embroidery is easier when in fact it takes a lot of trial and error to perfect too. You are right about machine embroidery. I have done some myself and it requires a lot of patience to get it just right. Oh my! How beautiful! And what a treasure! My mom definitely has an eye for matching colours. Kids are at an age where it isn’t a good idea to have anything that can get dirty on our coffee table at present! This is really beautiful. It’s going to be a heirloom to your daughters too! I’m sure your mother will be delighted to hear she has to make a second one. your family is so talented Colline, all this beauty to enjoy! I love looking at it every day. It certainly brings a lot of colour and lightness to that corner of the room. it is really beautiful = I love the purple boarder that closes it all in – 🙂 nice for spring too! Hey Colline – I have a few of the “joyful” pics up to share…. and I still have to share the fish art one from that batik piece – and will link when I do…. hope you have a great day!!!!! What an interesting idea John! I am sure it is a great conversation starter. What sort of things were in the news then? Colline, this is a beautiful piece. Something you can cherish for a long time. You might also hang it on a wall. That for darn sure a gift made with love. You’re lucky to be the recipient of it. I know that I am. I will treasure it for a long time. It’s beautiful. 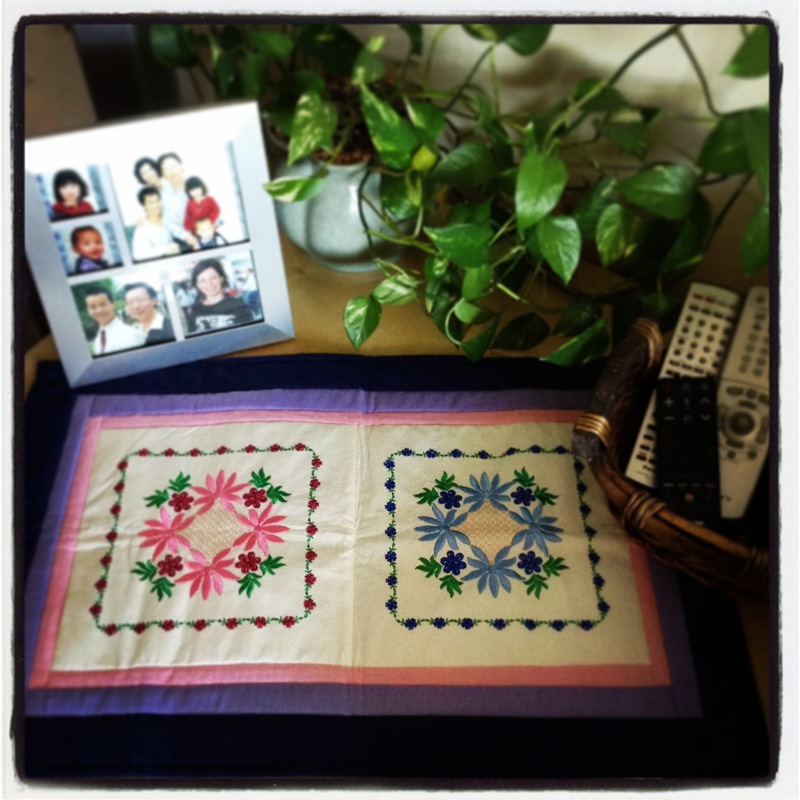 We have a couple of quilts that the better half’s mom and grandmother made and we cherish them. They certainly invoke beautiful memories of the loved ones that made them. Those are so beautiful, Colline. What a lovely gift from your mom. Thank you Michelle. It is doubly precious because she took the time to make it and then send it over here. I agree with you. It was made with love. That’s beautiful. A gift made with heart and love. Your mothers handiwork is lovely. What a tribute to your mom by photographing the runner displayed in your home and sharing it with all of us!